Sometimes you might want to stop Revit add-ins from loading. The obvious reason is if you use them infrequently and simply want to clean up the interface. Another reason might be to diagnose Revit software problems by returning Revit to a "safe mode" if you will. Recently we here at Revit Add-ons presented a session titled "Essential Revit Add-ons." To do so, we installed about a dozen add-ins. There were some negative effects: Revit sometimes stopped responding momentarily, and Excel would not respond when files were opened from Windows Explorer with a double-click. Because these problems weren't occurring previously, it's likely that they were caused by one or more of the freshly installed add-ins. But which one(s)? 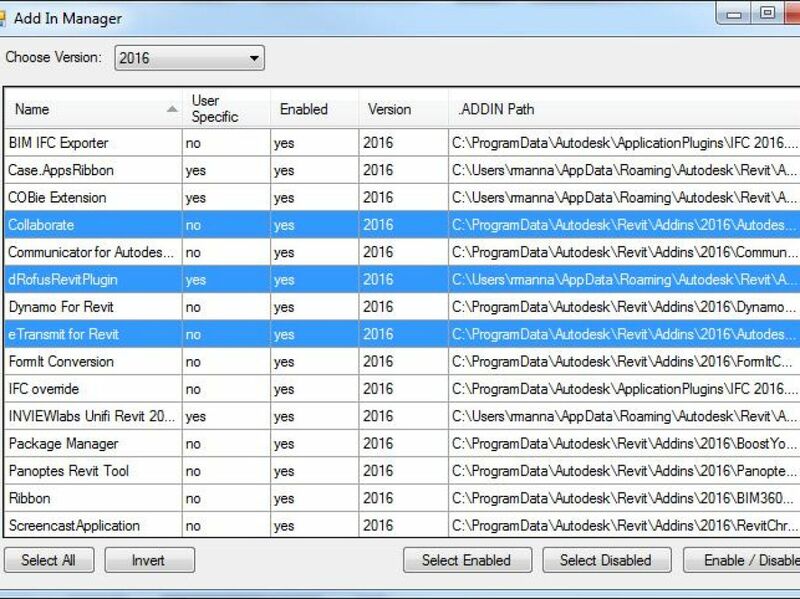 With the free and open-source Add-in Manager from Stantec, each add-in could quickly be tested by disabling the others from loading. Ladies and gentleman, I give you “Add-in Manager,” which acts as a safe mode for Revit. This ridiculously simple tool requires no installation. 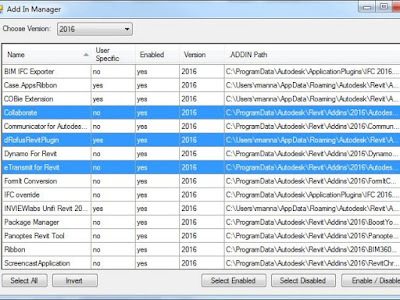 The Add-in Manager renames the *.addin file(s) so you can manually take charge any time you like. The download also includes the full source code. You’re welcome to do what you want, fork the code, make it your own, and even give back yourself. I hope you find this tool useful and that you appreciate our willingness to contribute to the larger design technology community. The free and open-source Add-in Manager is brought to you by Stantec. The original post announcing the Add-in Manager may be read on the Stantec blog.